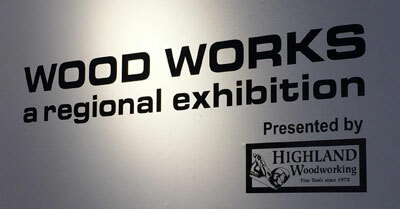 If you are within driving distance of Athens, Georgia, don’t miss the opportunity to visit this delightful woodworking exhibition that is open Tuesday thru Saturday, 10 AM to 4 PM thru Friday, Feb. 17, 2017 at the Oconee Cultural Arts Foundation in Watkinsville, GA.
Highland Woodworking is honored to be the presenting sponsor of Wood Works, a first-year exhibition that showcases a wide spectrum of woodworking with over 100 pieces by 35 southeastern artist craftsmen. Retired University of Georgia professor Abraham Tesser is the event’s curator. Wood is a medium that has been appreciated by mankind since the discovery of fire and the first use of tools. We still use wood to make fires and tools, but along the way we have come to appreciate this medium in many different ways. And that is what the show is about: The appreciation of wood. I have tried to present you with a broad swath of wood objects that I hope will compel your interest and delight. The Southeast has an abundance of talented artists working in wood. But what they love about the medium varies widely across artists. Many artists are attracted to the beauty in wood that is revealed as lumber is sliced from the tree. Often a slab of wood or a thin slice of veneer reveals a palette of colors or an interesting grain pattern; or, reflecting the irregular growth of the tree, an interesting overall shape. Several pieces in the show feature such beautiful lumber; several showcase the rare beauty of exotic veneers. Even tree branches that we are likely to ignore, discard or casually drop on the fire can be fashioned into beautiful, interesting and functional pieces of furniture. Some artists are concerned with preserving the environment and use reclaimed or salvaged wood. Age, weather and usage often give wood (and us!) a special character that enhances the interest value of pieces constructed from it. So this is the show. Pieces of wood that have been skillfully, artistically transformed into the objects before you. Have these objects engaged you, captured your interest, piqued your curiosity or perhaps even delighted you? To the extent that they have, our efforts have been successful. CLICK HERE to see our other write-up of the event with reviews from local media organizations. Absolutely beautiful stuff. Sorry I’m at the other end of the Country.